There are times when your iPhone experiences such an error that the only thing left for you is to reset all settings. If you are wondering what this is all about, or how to go about it, read on. What is “Reset All Settings”? Just as the name implies, by selecting “reset all settings”, there would be a reset of all settings on your iPhone to default, including all network settings and personal preferences. Only your system settings will be reset. You will not lose any apps, data, documents or files. Do you need to backup before you “Reset All Setting”? It is advisable for you to keep a backup of your iPhone. In this case, it is not necessary for you to backup your iPhone as resetting all settings will not result to loss of data. Go to Settings app > General > Reset > Reset All Settings. You will be required to enter your passcode. After entering your passcode, the reset will start. Reset all settings can fix iPhone issue when you it's caused by wrong setting. But there is a big chance that iPhone issue was caused by some baleful files. Some iPhone corrupted files, temporarily downloads, crash logs, and other useless files would cause iPhone issues some times. If you have no idea the cause of your iPhone issue, you can take advantage of iMyFone Umate Pro (running on Win or Mac) to better perform your iPhone or iPad. Umate Pro iPhone Eraser can handles the issue which is caused by any reason. Clear Junk & Temp Files: It's one-click function assists you find and clean corrupted files, crash logs, cache, temporary files and other useless files from iPhone, which fixes iPhone issue and speed it up. Completely Reset: All the issues will be fixed permanently if you apply "Erase All Data" for iPhone, which is safer than iPhone reset. Wipe Deleted Files: Previously deleted files still remain on your iPhone drive, which would cause unknown issues or explose your privacy. Let Umate Pro to wipe them gone forever. Remove 3rd-Party App Traces: When using apps, incomplete fragments will be generated in background and left on your iPhone. Erasing them will save iPhone from being influenced. Step 1. Launch the iMyFone Umate Pro iPhone Data Eraser on your computer. Connect your iPhone to your computer with a USB. Step 2. Go to “Erase All Data” tab and click on “Erase” button. 1-Click Free Up Space: If you want to clean baleful files, choose this mode to scan and clear. Erase Deleted Files: If you want to make previously deleted files gone forever, run this mode to scan and erase. 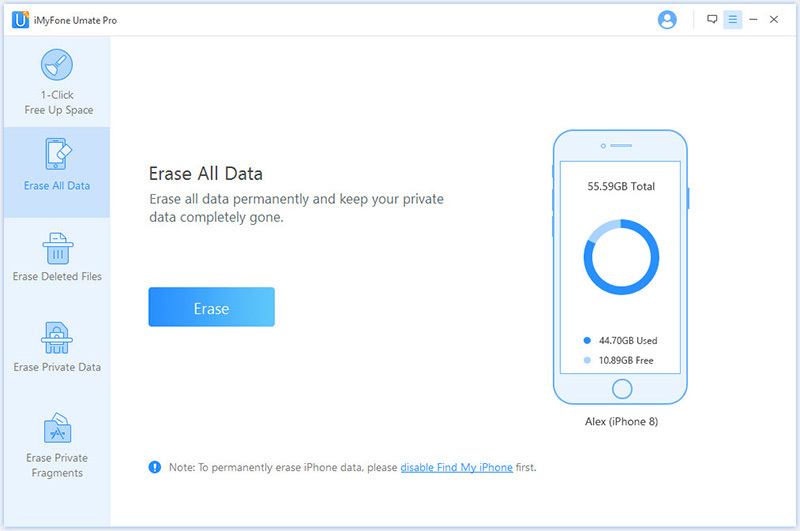 Erase Private Fragments: This mode will scan third-party apps on your iPhone and show you the traces to wipe. Step 3. Type “Delete” in the box to confirm and tap “Erase Now” button. After these steps, you will have to wait for few minutes and your iPhone will be totally erased, having no chance of being recovered. Why Choose iMyFone iPhone Data Eraser? Not only us, but also some famous software review media recommended iMyFone Umate Pro to reset iPhone securely, like getintopc.com, MacWorld, APPKED, pocket-lint and 50+ more. When you go to Settings app > General > Reset, you will see a few settings there. But do you really what the differences are between them. Let’s have a closer look. Reset All Settings: This will reset just the settings and won’t harm or affect your data. Erase All Contents and Settings: This will totally erase the iPhone. It will erase and reset your data, settings and every other thing on the phone. This option is a factory reset option, and is usually made use of as a last card when there is a severe iOS problem. 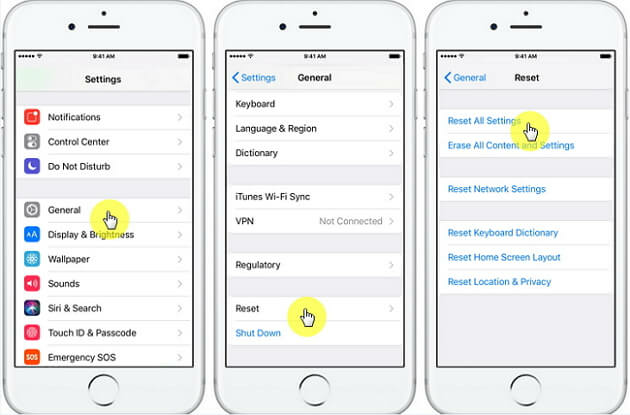 Reset Network Settings: This will reset just the network settings of your iPhone. All the WiFi usernames and passwords you have saved on the iPhone will be erased. This option is useful in fixing different network problems. Reset Keyboard Dictionary: In general, it will save your own typing in keyboard dictionary. There are times when the iOS system doesn’t get it right. When you reset keyboard dictionary, it will clear all the words you saved in your dictionary. Reset Home Screen Layout: Using this option will reset your iPhone’s home screen to its default layout. If you move a stock app out of the home screen, this will return it home. Reset Location and Privacy: This will reset the location and privacy settings to the factory default, including”Find My iPhone”. But note that, the default settings are set to Off.